Both sexes fully winged. Female body brown, head and thorax paler than abdomen, head commonly with cheeks darker than median area; legs mainly yellow; antennal segment III yellow, also basal half of IV & V; fore wings brown with base sharply pale. Antennae 7-segmented, III-IV with sensorium forked. 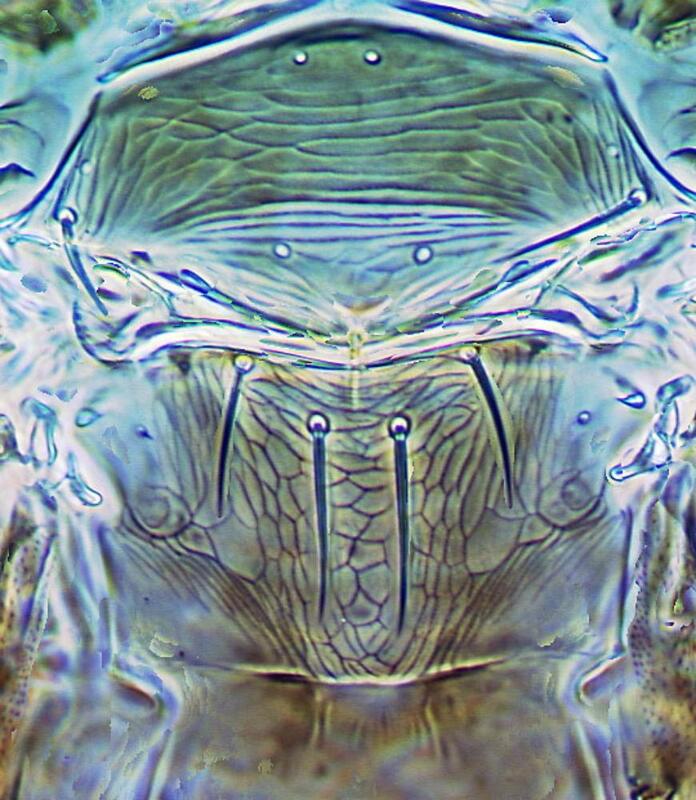 Head wider than long, ocellar setae pair III small and arising on anterior margins of ocellar triangle; postocular setae pairs I & III slightly longer than ocellar setae III, postocular pair II minute. 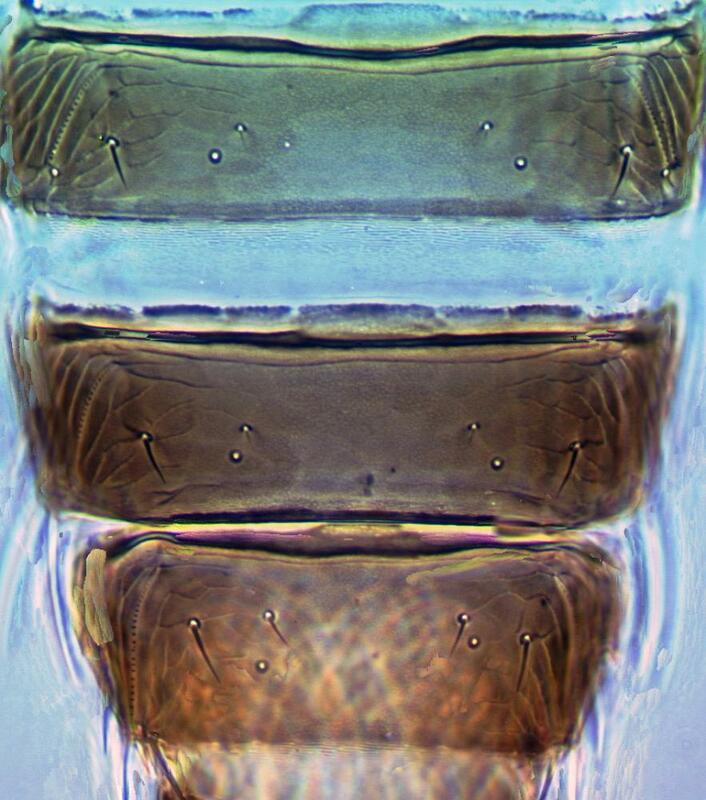 Pronotum with 2 pairs of long posteroangular setae; posterior margin with 3 pairs of setae. Metanotum reticulate medially, reticles varying in shape and sometimes with faint internal sculptured markings; median setae long, arising behind anterior margin; campaniform sensilla absent. 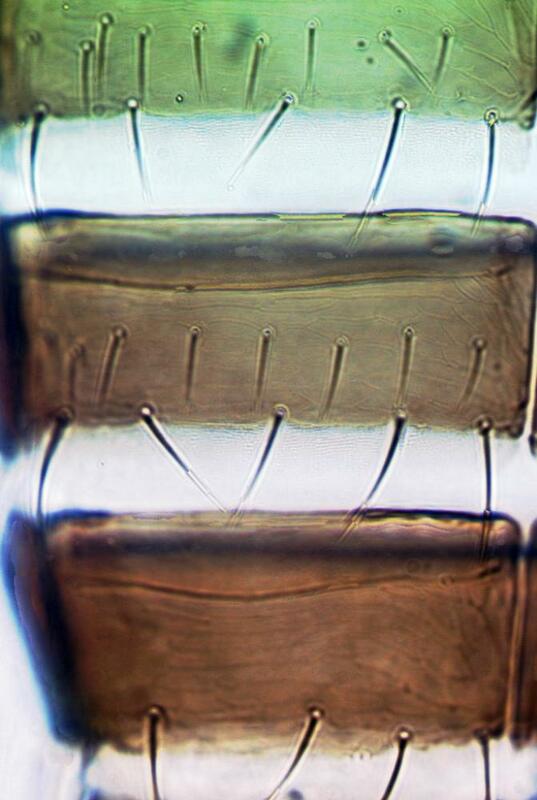 Fore wing first and second veins with complete rows of setae; clavus with 5 marginal setae. Tergite II with 3 lateral marginal setae; tergite VIII posterior margin with comb almost absent; pleurotergites without discal setae. Sternites II & VII without discal setae, III–VI with about 6–12 discal setae in an irregular row. Male yellow; tergite VIII with no posteromarginal comb; sternites III–VII each with small transverse pore plate, discal setae arising laterally. T. parvispinus has not been found in California. It is included here because it is a potential invader of mainland USA since it is abundant on Hawaii. It is one of a small group of Asian Thrips species, including Thrips orientalis, in which discal setae are present on abdominal sternites III to VI but not on sternite VII. 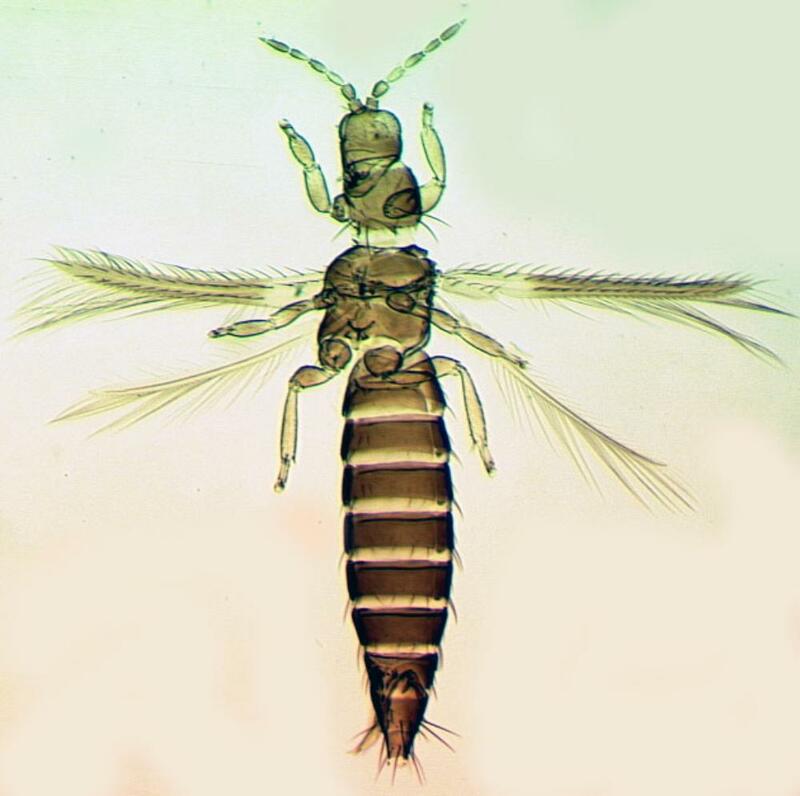 Thrips is the second largest genus in the Thysanoptera, and currently includes, worldwide, about 285 species. All members of the genus lack ocellar setae I on the head, and they all have ctenidia on tergite VIII posteromesad to the spiracles. 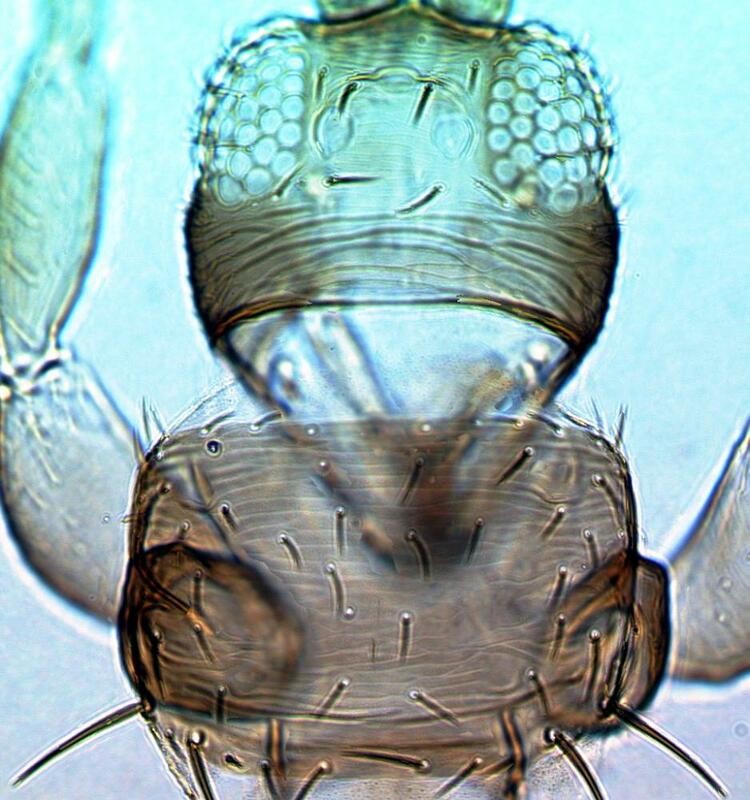 Other characters, such as number of antennal segments, number of setae on the fore wing veins, and number of discal setae on the sternites are variable between species (Palmer, 1992; Mound & Masumoto, 2005). Serious damage to plantations of pawpaw (Carica papaya) in Hawaii, damage to various food crops in S.E. Asia, also to greenhouse Gardenia plants in Greece (Mound & Collins, 2000).